Whoa, why don't you let yourself just be wherever you are. I've never seen you look like this before. Whoa, why don't you let yourself just be wherever you are." I love Connie and steven! They are soooooooooooooo adorable! It's more breathtaking if you hear Steven singing "Be Wherever You are." In the lyrics, replace the word "faces" with "face, woaah". No other ship in the SU fandom is as cute as this one! Yay!!! Such a cute picture! Awesome job!!!! I always die whenever I see work like this... so I've been killed over 100 times by great artists like you. Great job!! AHH I love it I love it I LOVE IT! AHH THE SHIPPING IT BURNS!!!! ship it. ship it like Amazon Prime. Best shipping ever, and it's canon to the show as well! Very noice! "Why, we're all mad here." From this angle, it kind of looks like the hamburger's stalking them. It's alive, I tell you! This is beautiful... Thank you for making this, it made me smile a lot ;-; you, ma'am, are the standard of art I am trying to meet! Beautiful! Is that Harry Potter? I love it! It's a very lovely and sweet scene that makes me feel happy and contented. The kids look terrific, very nicely drawn and great color & shading plus good poses to give them life. 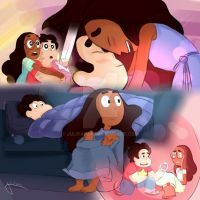 I love Steven's adoring look, and Connie's sleepy smile is fantastic. Also it's cute how she's hugging the sword, thinking of him no doubt. Lovely work on all of their other items from the show too. They were definitely had a lot going on, and all the more fun together. Thanks. Cutie pies! Can't they get married already?! So cute!! I love it so much! Aww they both look so freaking adorable! Love all the details on them and of the shade and all their possessions are so nicely done! Love Rose's sword the most, beautiful work all the way!